The artist brought the letters I, V, E, C, H, A, N, G, E, D into the Olentangy River. The artist brought 20 friends to the banks of Olentangy river. The artist held the words against the current until they melted. The artist asked 10 friends to help carry the letters, I, V, E, C, H, A, N, G, E, D, into the Olentangy River. The artist asked 10 friends to freeze the letters as photographs. The artist asked 20 friends to keep the artist still if the current and the ice were too strong. They were not. 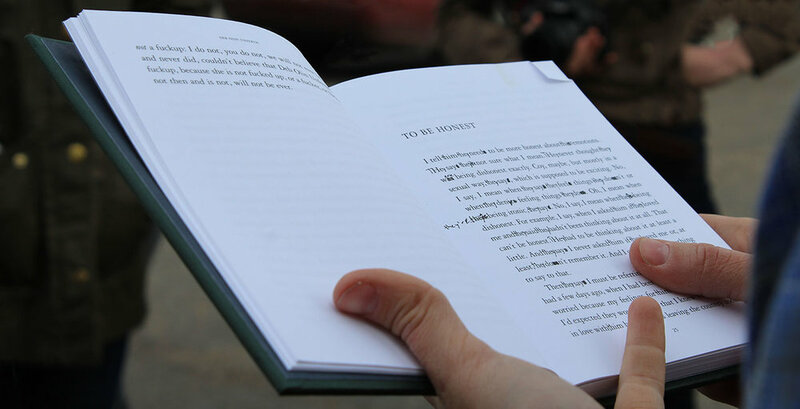 The artist read “To Be Honest” by Deb Olin Unferth, to 20 friends, after the artist changed the pronouns in the poem/essay to neutralize gender.